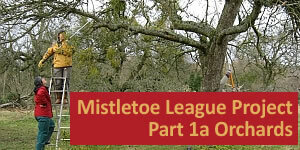 Previously on the Mistletoe League…. 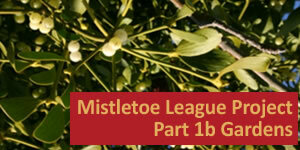 The Mistletoe League is a public participation survey gathering information about mistletoe of fruit trees, seeking observations on management practice and attitudes, the harvest and on any (fruit) varietal preferences. 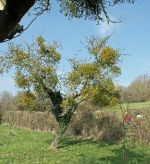 The issue of mistletoe management on older apple trees is a particular problem – if neglected the trees can become dominated by mistletoe, resulting in premature death of both host tree and mistletoe. Though the project is primarily about fruit trees in orchards and gardens rather than mistletoe in the wider environment there is a section collecting information on non-fruit tree hosts too. Part Two: Fruit tree varieties – which are preferred? 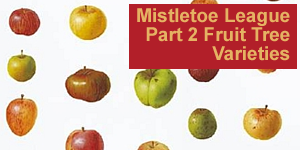 Which apple varieties does mistletoe grow well on, and which varieties resist mistletoe most effectively? There are definitely differences between varieties – but we have little hard information. Part 3 aims to gather information on how mistletoe is thriving, and whether it’s increasing or decreasing, in the wider countryside and in gardens where it’s not on fruit tree hosts.